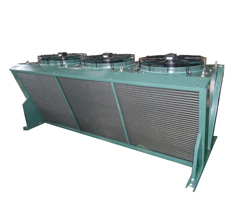 Air-cooled condenser is the heat radiating equipment using the air to make cool, matching the refrigeration equipment with freon refrigerant. It can be divided into 3 series: FN, FNS, and FNV. The first 2 series use the side fan, and FNV use the top fan. 1).The shell is of good quality stainless steel, with plastic spray surface, corrosion-resistant and beautiful outlook. 2). 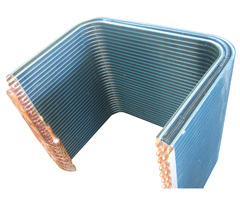 The coil is crossed-arranged, using the mechanic method to expand the tube, which make the copper tube and the aluminum fin jointed closely,to achieve the good heat exchange effect. 3). It is after air-proof test under 2.8Mpa, and system sewage treatment. 4). The refrigerant can be R22, R134a, R404a, R407C etc. 5). FNS condenser use the big air volume, low speed motor, which is built inside the units, with low noise, beautiful outlook, widely used for theequipment with high requirement for the noise. 6). 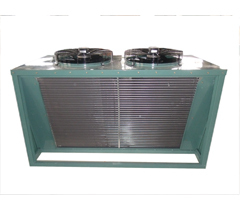 FNV condenser have big windward, good heat exchange effect, and external rotor fan, which can be widely used for the bigger condensingunits.